INDIANAPOLIS, Aug. 10, 2014 – Marc Marquez’s perfect season rolls on. The Spaniard pulled away in the second half of the Red Bull Indianapolis GP on Sunday, beating Jorge Lorenzo by 1.803 seconds to win for the second consecutive year on the Indianapolis Motor Speedway road course and continue an incredible 2014 season. The 21-year-old has won all 10 races so far on the MotoGP World Championship schedule, an extended run of dominance not seen in the sport since Australia’s Mick Doohan’s won 10 in a row in 1997. His afternoon at IMS began with a struggle as he fell from the pole position to fifth moments after the race began and needed 10 laps to work his way back to the front. But once there, the defending world champion held steady for the final 17 laps on his No. 93 Repsol Honda and became the first back-to-back champion at the Red Bull Indianapolis GP. Marquez won for the fourth consecutive year at IMS, having also won in Moto2 in 2011 and 2012. In winning on Sunday, he also secured the 500th Grand Prix win for Spain. No. 499 came from Efren Vazquez, who started Sunday’s racing with a win in Moto3 after a fierce battle among five riders in the closing laps. Italy’s Romano Fenati led coming into the front straightaway but Vazquez ran him down in his Honda for a 0.065-second margin at the Yard of Bricks and his first Moto3 victory. 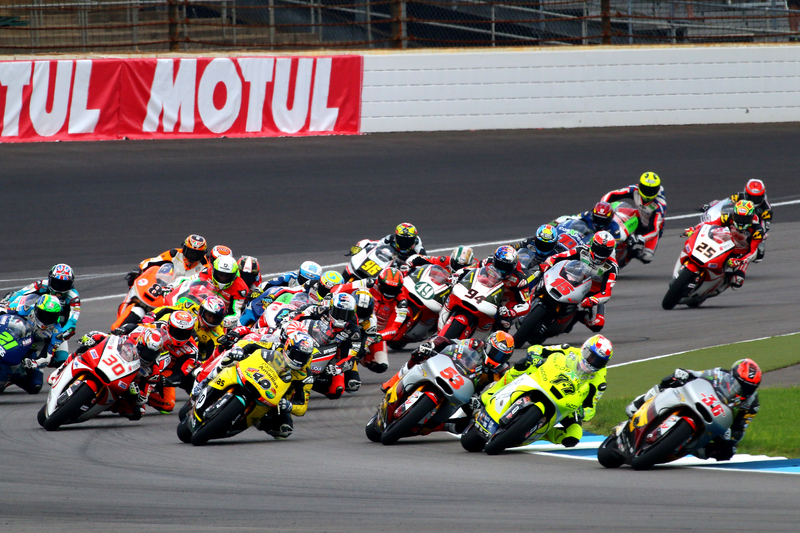 Moto2 featured a dominant wire-to-wire performance by Mika Kallio of Finland, who led all 16 laps in a shortened race following an early red flag. His margin at the finish was 1.380 seconds over Maverick Vinales of Spain. In the AMA Pro Vance & Hines Harley-Davidson Series, Steve Rapp won in a five-bike shootout in the closing laps. The Red Bull Indianapolis GP will return in 2015, with a race date to be announced in the future.